Dig in Day! We need your help to get this season off to a great start. Prepping, planting, composting, and mulching. April 29th and May 27....we hope to see you there! Each year the first grade students come to Grow to Share in the spring to gain hands on experience in gardening and giving back. They then return in the fall as second graders to pick the vegetable they planted. New this year is the help of their individual Fourth Grade Buddies! The mentor will team up with his/her first grader and help Grow to Share together. This is a phenomenal opportunity for the students to see where their food comes from and to learn more about gardening. We need volunteers to guide and lead the students as they enter through this exciting experience. We will meet a half hour before the students arrive to ensure that you feel comfortable with your role for the day. If you are interested in volunteering during this time, please sign up here. 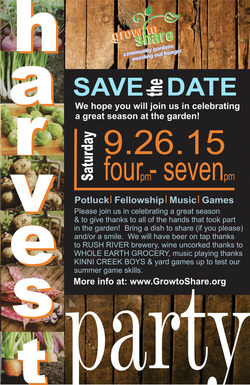 Join us in celebrating a great season at Grow to Share! Sept 26 from 4pm-7pm we will be coming together to celebrate all the wonderful food the garden has produced, the hands that made it possible and the support that this community has given. We hope you take the opportunity to come out and take part in this great community we have. See you there! This fun event will be a mix of eating, mingling, sharing, and planting! We will have pancakes, eggs, meat, juice & coffee as well as smiling faces. We hope you will join us in getting our garden ready for the 2015 season, touring the garden to see what is new and enjoy an opportunity to mingle with our great community! We are looking for cooks & greeters so please sign up here if you are interested in volunteering during this event. Each year, middle school students choose community organizations that they would like to give their time to and learn more about. This year, Grow to Share is one of many organizations chosen by the middle school students! We would like your help to delegate and lead the students as they work in the garden and participate in a meaningful experience. We will meet a half hour before the students arrive to ensure that you feel comfortable with your role for the day. If you are interested in volunteering during this time, please sign up here. Each year the first grade students come to Grow to Share in the spring to plant a chosen vegetable. They then return in the fall as second graders to pick the vegetable they planted. This is a phenomenal opportunity for the students to see where their food comes from and to learn more about gardening. We need volunteers to guide and lead the students as they enter through this exciting experience. We will meet a half hour before the students arrive to ensure that you feel comfortable with your role for the day. If you are interested in volunteering during this time, please sign up here. We have burned, we have tilled, now we plant! Come to the garden and help us get the beds ready and planted for the 2015 season! You may sign up here or feel free to just join us out at the garden!